Leviticus 9 describes God (through Moses) setting apart Aaron as high priest, and his sons as priests as well. Priests were different, set apart from the rest of the people. Hebrews 4:14–16 tells you that you have an even greater high priest, but in him you have a higher position than any of the Old Testament priests. You have a great high priest. Your priest has ascended. The author of Hebrews has spoken of Christ as the Apostle (Hebrews 3:1)—the one sent by God with the message you are to heed. He is greater than the angels and greater than Moses. But he is also your high priest. When Jesus is compared with Aaron, Hebrews always calls him a high priest. His work includes obtaining redemption, by his death, but the emphasis here is on his intercession. He is greater than Aaron or any other priest. You need no other human priest. Aaron and the other priests were set apart by sacrifices, anointing, and an elaborate ceremony. Your priest has passed through the heavens. He is not limited to (or by) the earth, as the Old Testament priests were, but continues in the heavens today. His name is Jesus, the Son of God. He is the Savior, he is the divine Son of God. Therefore he is the most effective priest possible. Hold firmly to your faith. Christ is the greatest high priest. He is God himself, your representative in the highest heavens. So, hold firmly to your faith. Don’t fall away, Hebrews 3:12. Hold on to your confession, Hebrews 3:1. Don’t let anything dissuade or shake you. Don’t let anything distract you from him. Your priest is just like you. He is not unsympathetic. You might think so because of his majesty. He is God, he is the great high priest. “The contemplation of Christ’s greatness in verse 14 might lead people to have lofty ideas of Him as One who could not have any feeling for them; therefore the author goes on to assure them: ‘For. . . we have not a high priest that cannot be touched with the feeling of our infirmities. . . .’” (Geerhardus Vos, The Teaching of the Epistle to the Hebrews, p.102). He knows your weaknesses. We are mortal, subject to sin and to its curse. Yet Christ shared in our weaknesses, Romans 8:3; Philippians 2:7,8. There is no problem, no abuse, no suffering you face that is unfamiliar to him. The Sinless One was tempted. Christ was tempted in every way. The temptation in the wilderness paralleled Adam’s. There were constant temptations throughout his ministry. The struggle in Gethsemane was temptation to abandon his Father’s will. He knows all your weaknesses, discouragements, temptations, and trials—and thus he is the perfect mediator. Yet he was without sin. One difference between us and Christ is in the outcome of the temptation. He was perfectly sinless, Hebrews 7:26. “The sinner who capitulates to the first solicitation to evil cannot claim to have felt the full power of temptation. It was otherwise with Jesus who experienced the anguish of temptation to an unimaginable degree, for his immaculate person was was subjected to the continuous assaults of the Tempter.” (Geoffrey B. Wilson, Hebrews A Digest of Reformed Comment, p. 58). Come boldly to God. As priests approach the throne. This is a throne of grace. Thrones can be dreadful: Esther, Isaiah 6, Matthew 25:31ff. The Most Holy Place was the symbolic throne of God. Only the high priest could enter, and that only once a year with sacrifices. God’s people needed an order of priests to intercede for them, to act as go-betweens. But it your high priest, you have become a kingdom of priests, 1 Peter 2:9. 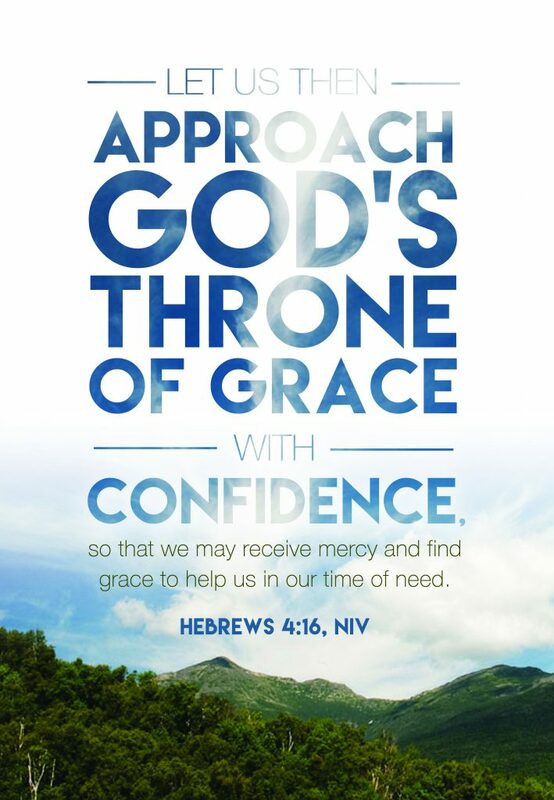 As you come to God in Christ you find that this is a throne of grace, of undeserved favor. It is the kind of throne you can appreciate—the kind you need. Come boldly. Approach with confidence. The invitation is free to those who come through this high priest. Obtain mercy and find grace to serve God. You need mercy, which is favor to those who deserve wrath. The all-knowing Word of God, Hebrews 4:12, 13, shows your need of it. Hebrews urges you to ask for mercy. Find grace in time of need. You need help–you are totally unable to help yourself. The fall has resulted in total inability. God provides the help you need in Jesus Christ. At exactly the time you need it, that is when God gives help. A priest in the Old Testament spent his life in serving God, offering sacrifices in the tabernacle or temple and teaching the people. When the Word tells you that you, as a New Testament believer, are a priest, there is wonderful privilege involved. You have direct access to the throne room of heaven. But you also have the responsibility of living a life that is set apart to serving God. That doesn’t mean that every believer has to seek the foreign mission field or the ministry. But it does mean that the details of your life need to be directed to the glory and honor of your God. You are set apart to serve him. Christ knows you. He is just like you, but is sinless. Come, and keep coming, to him. You always need his grace and mercy. Come boldly, with confidence, for God is faithful to you. He has set you apart as a kingdom of priests to serve him. Live that way!